I want to go to Littlegate this weekend. My cousin lives there and there are shops, a cinema and great restaurants. It’s easy to get there. A return ticket by train only costs £7. There’s a brilliant market too and we want to go there to buy some jeans. I want to spend the weekend there with my friends. We usually go there in winter to ski, but this time we want to climb to the top – it takes about 4 hours, but then you can look down on the sea. I just hope my new boots are comfortable! 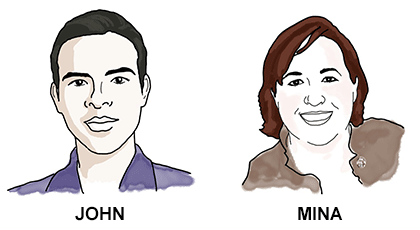 Examiner: Hello Mina, hello John. My name is Richard. The Examiner will select questions from those provided in the test pack, in a variety of areas such as name, nationality, work/study, where candidates live, and free time activities. What do you like about your job? / What do you like about studying? Do you enjoy your work? Why? Why not? The questions in this phase are on general topics about your life. Your answers are from your life and experience. There is no right or wrong answer. Remember there are different topics in each exam. Do not memorise a speech on a topic for the exam. Examiner: Now I'd like you to ask each other some questions. Mina, I'd like you to ask John about his neighbours. John, I'd like you to ask Mina about her favourite time of year. Now think about the questions you want to ask. You have one and a half minutes. You can write down your questions if you want to. If you don’t understand, please ask me. Examiner: Mina, are you ready? Please ask John your questions. Examiner: John, are you ready? Please ask Mina your questions. Examiner: In this part of the test, you are going to listen to two recordings and answer some questions. You can make notes if you want to. You hear two people talking about their plans for the weekend. Where do they want to go at the weekend? 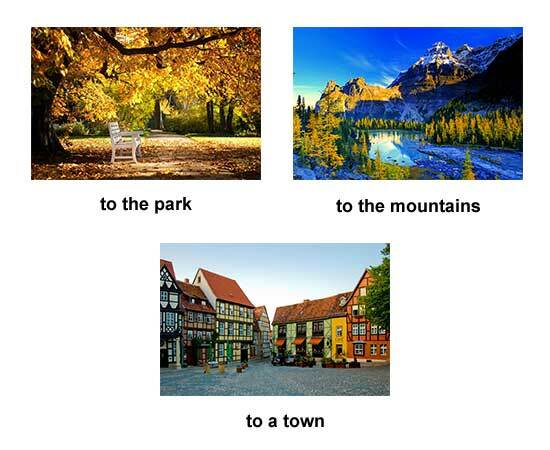 To a town, to the mountains, or to the park? Examiner: Mina, in the first recording, where does the woman want to go at the weekend? To a town, to the mountains, or to the park? Examiner: John, in the second recording, where does the man want to go at the weekend? To a town, to the mountains, or to the park? Examiner: Now listen again, and answer these questions. Examiner: Mina, in the first recording, who can the woman see in Littlegate? And how much is a return ticket? Examiner: John, in the second recording, how many hours does it take to climb the mountain? And what is the man worried about? Examiner: Now you’re going to talk together about places you like to go to at the weekend. Talk to each other about places that you like to go to, and what you like to do there. Which places are good for children to go to? What do people in your country like to do in their free time? Examiner: Thank you. That is the end of the test.